No card today, but I wanted to update after our ultrasound today. Thankfully, all parts were accounted for and she looked NORMAL! She was extremely hyper though! We didn't get a lot of good pictures, but I'll share two of my favorites. 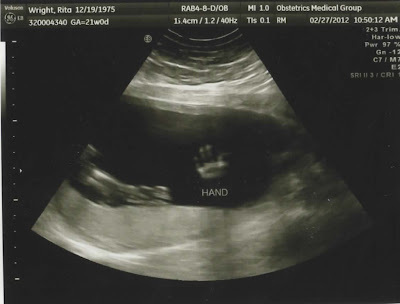 She was determined we would NOT see her face today and kept her hands up there the whole time! I'm not sure if she's play peek-a-boo already or if she might be practicing her boxing skills. How cool is this one? I love it. It was fun to see her little hand so clearly! There's another one of her foot as well, but I am a bit tired of running to the scanner, so I'll try to scan that one in later. Finally, here's another outfit that we bought for her last week. I don't want to overdo it with the crab stuff since that is Eli's thing, but I had to get her at least one outfit. Plus it was navy, which I love. There's a big red crab embroidered on the bum of this one and I love it. I'll try to get some stamping in soon now that I can quit worrying about Laila so much! I hope you aren't getting too sick of hearing about her! It is so hard not to share the excitement. Thanks for sharing the baby pictures. I am excited for you! And, I for one, never get tired of reading about the new baby. These are totally awesome piccies. I don't think any of us will get tired of your excitement over Laila. Loving seeing all her pretty outfits too. You absolutely do deserve a baby shower - so sit back and enjoy it. Everyone wants to share their excitement and joy with you. So so fun! Don't have a shower....call it a "sprinkle":-) And you NEED one! 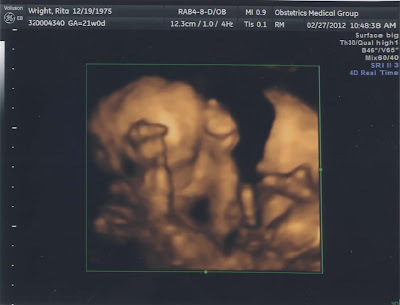 She's a girl, you need totally different stuff...including SOME pink, hehe:-) I LOVE that she's waving at us by the way! Aghhhh...stupid blogger didnt tell me you posted this so I was wondering about you all night last night and finally came to your blog this AM to check things out. YEAHHHH!!!! Love the pics and that outfit is adorable!! You totally need a second shower...your friend is right!! It is a way to celebrate the joy. Wish I lived closer...I'd demand an invitation!! That hand picture is so cool!